I had done sketching and painting in my student life so I had a fair amount of artistic background, I haven’t produced any CG work to my satisfaction till yet. To acquire more knowledge of a good CG scene I wanted to complete a good composition. It was time to learn few new things. I wanted to portray a scene relating to a typical Indian Home in summers. Call me lazy 😉 I did not want to do more modeling unless I have some learning experience with the scene composition in CG, also I wanted to utilize the car model of ‘Amby’. After deciding on the main character, I finally came up with the idea of a scene “A typical low down porch, Ambassador parked under it, front part brightly lit with summer sun at noon and back of the car under the shade of porch”, a distinctive Indian home. 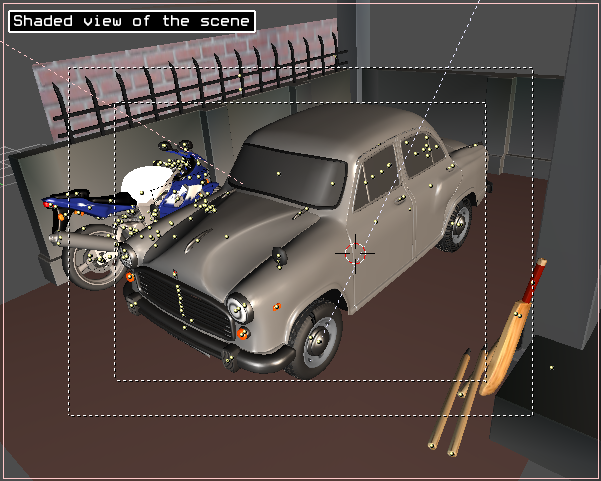 There was need of more extras in the scene, fortunately for me the choice of models was not complicated, a bike most probably Yamaha, Rajdoot, Enfield and Yezdi, but since I already have one Yamaha model. Although the actual Yamaha bike used in the composition was not available in India, but the model I had made earlier was of very similar styling. The further list includes cricketing stuff, low concrete boundary wall with nail grills – typical to 90’s buildings. Some other parts were left out of the scene as the final camera angle was quite low. One of the most important aspects in the scene which came to me in an instant was the presence of shadows of leaves on the floor just ahead of the car. The only thing I did without hesitation and never changed throughout the test renders was the position of leaf shadows in the scene. I kept the camera aspect a bit wider as to catch ‘Amby’ in a bigger role. The floor of the porch was a simple texture of tillable floor bricks (it was downloaded from the net), I choose it as it had the warm colour good for the scene. The wall texture I used texture looked like a concrete wall, beaten with rains. Choice of colour for the car was no secret, the most dominating colour on Indian cars at that time was ‘off white’, for Amby I keep it slightly yellowish in tone. The colour of bike was completely in sync already. I modeled Cricket bat and the wickets, gave them willow texture and refrained from advertising the logos :D. Next I worked the floor textures (in the GIMP) of to get proper sizing for the bricks. One of the important parts of textures in the scene was the steel material on the car since it was directly in the main visual. Although it is simple to make a steel material theoretically but that was just not enough for this outdoor scene, the steel had to reflect convincingly the environment. 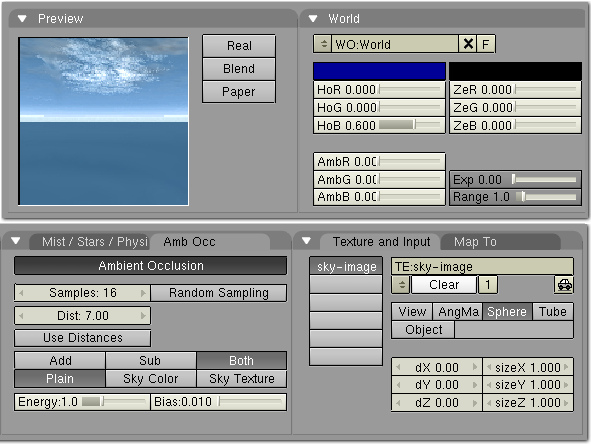 I tried sky textures (spherical mapped) some ‘without clouds’ and some with ‘less dense clouds’ importantly they all have bright blue sky. I got some from http://fls-tech.com there are some free skymaps also made available by “Madcow” at elysun. The lightening was done by three sources (not three point light setup). I used one sun (light reddish-orange colour to effect warmth in the scene) for sharp shadows and also as the main source of light direction. Two Area lamps (white) spread with low intensity and no shadows, this was done to get more ambiance around the back of the car, since only one lamp was enough to lit the darker area at the back of car. While using AO (blenders GI) there were visible grains in the scene even at high samplings. One important part of the light setup was two lamps focused towards the car Head-lamps. The lights were kept on the same layer along with headlamps. 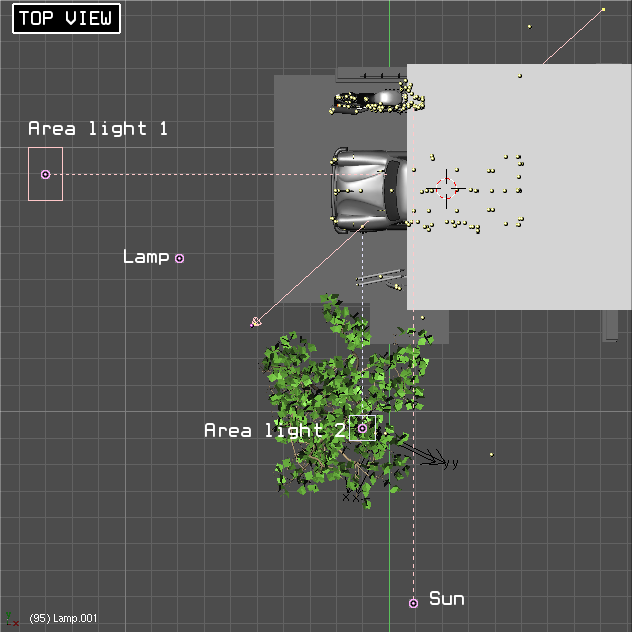 As of why I used them well… it was actually a funny problem, car headlamps were appearing blacker or darker and were real put off in the scene (this problem, however, continued with Yafray renders too, and I think it was due to the reflection problems related to camera angle). Using the two lamp combo overcame it quite right. Using AO made the scene more realistic. 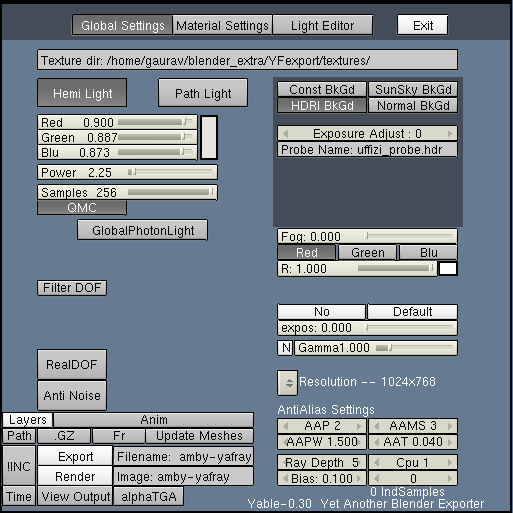 AO or Ambient Occlusion is a GI method in Blender. Many thanks to ‘Ton’ and his Hackers. Tip: One thing I do after I finalize my scene is removed all the meshes which are not directly or indirectly come inside the visual. I do it to reduce the AO computations on the objects that are not required, a simple hack as my hardware is not very fast. 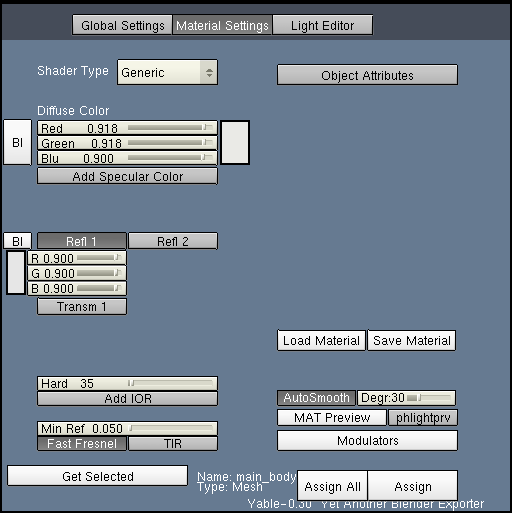 Here are the screen shots of various settings in Blender. Image2. Lights setup, top view. Image3. 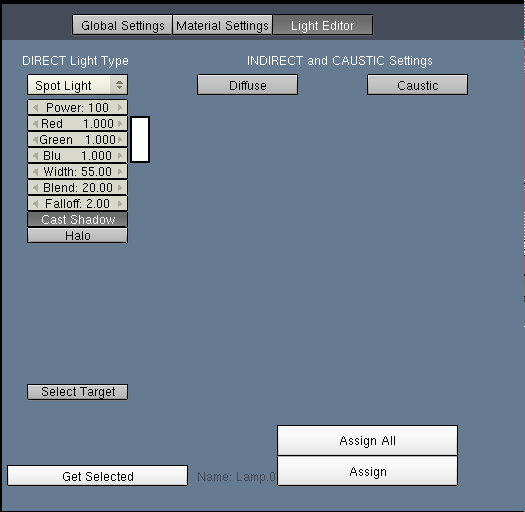 Lights setup, front view. Image4. Lights setup, side view. 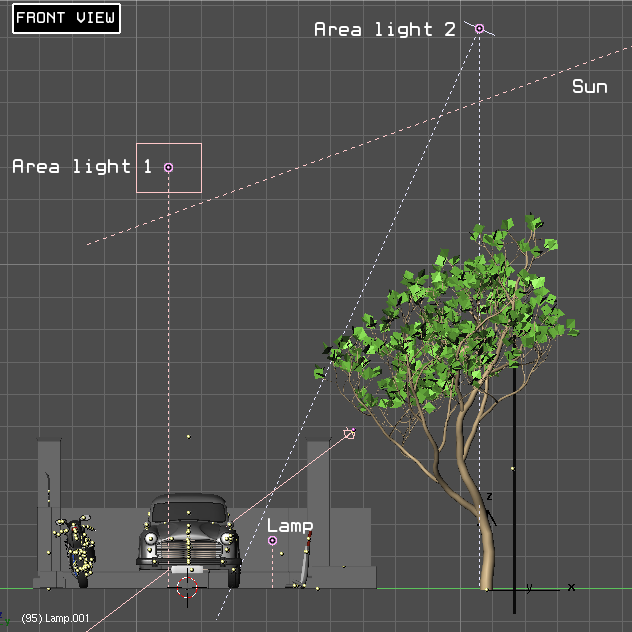 Image6 – Shaded view of the scene. Blender2.33 both for modeling and rendering. 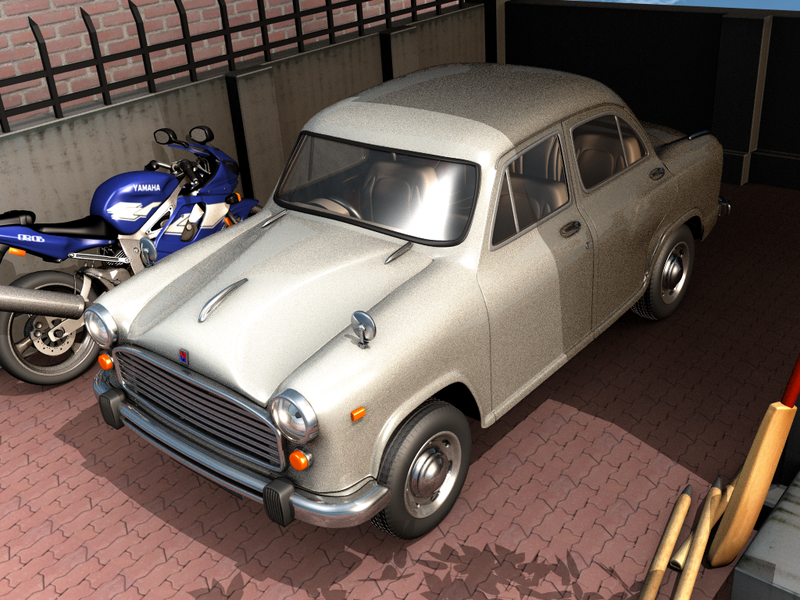 After completing one satisfying scene in Blender, I wanted to use Yafray (at that time it was used in combination with Yable and Yafray exporter script) so I went ahead and tried a different approach using the same car model with a different scene in Yafray. In my earlier attempts, I had little or no success with Yafray/Yable so this was the only motivation kept me going. This time, the choice of composition was quite opposite to the Blender rendered scene. I wanted to have a “lowly lit scene just after the rains” but with a sense of some coolness in it. Technically this meant that I have very less or approximately none direct shadow casting lamp available in the scene. The ambiance of the environment was the primary source of light. I chose a simple setup, the Amby now stands in a makeshift parking lot. A large wall behind, a beaten floor and bunch of bricks lying around. The scene actually evolved more than I wanted to pursue, with the addition of first a single wet brick lying next to car tyres then the scene also had more bricks and the wall footer for the parking and also another car appeared in later stages. 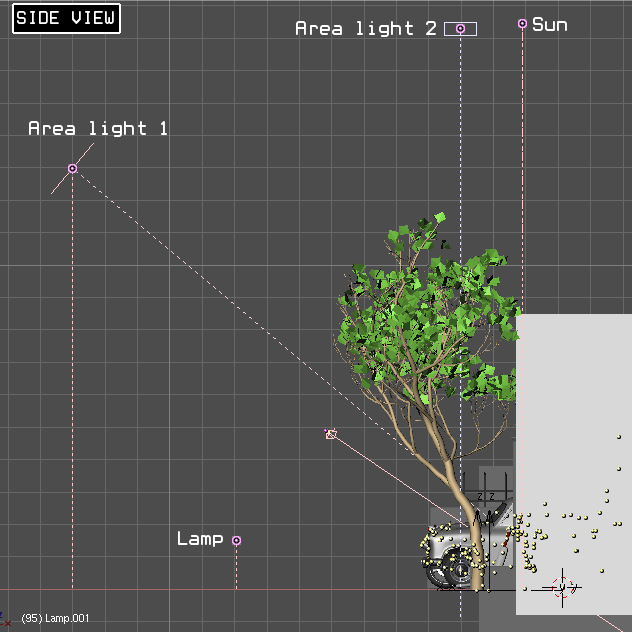 The scene has a back wall having the same texture of the wall used earlier in the Blender rendered scene. The ground texture was again a single texture downloaded from the net. 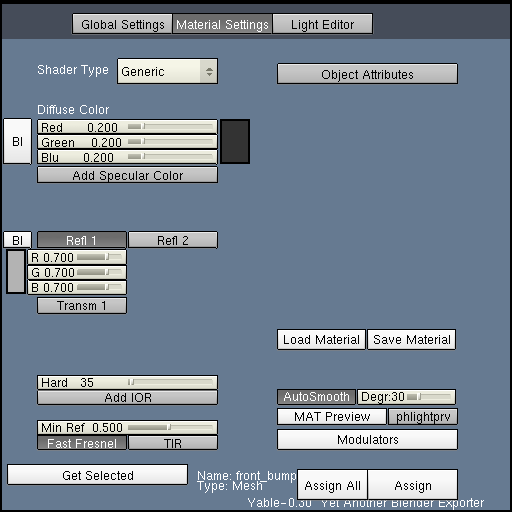 The car paint setting are modified form of chrome settings, available in the Blender manual 2, and so was the glass material. 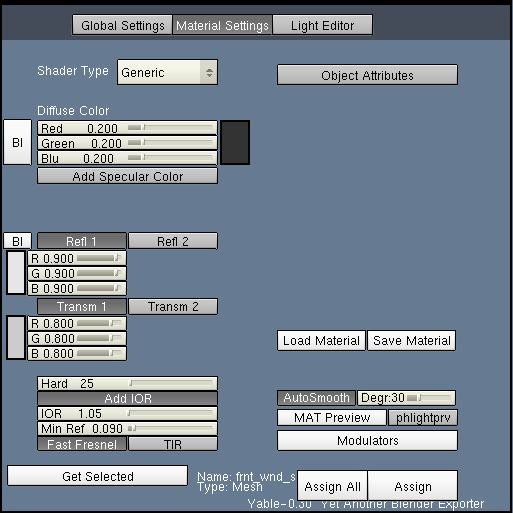 Settings for the materials in Yable X. The choice of lightening was pretty straight forward. Hemi light was setup as GI. One very low powered spotlight from the left side of the car to get subtler shadows around the bottom of the car. And the most important part was once again the environment which was providing those lively reflections. My choice of using HDRI was to get the ‘visual depth’ in the scene. Image13 The Final composition for Yafray Render. Although I finished working on it but there was one problem left in the scene, which one elysiun member had already warned me, it was that the lower portion in the scene was too darker. I completely forgot to fix it but I think, in the overall composition the contrasting colours made it stand apart also. Render for the final scene took 2-4 Hrs on AMD Sempron 2500.